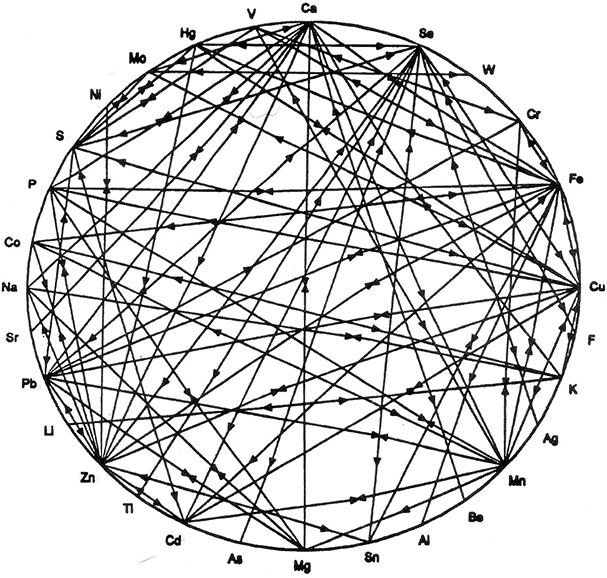 The mineral wheel illustration is a very useful visualization of the complexity of soil-mineral relationships first promoted by Mulder in 1953. It is a diagram showing how the levels of soluble/interactive minerals in the soil affect their uptake and utilization by plants. Though the mineral relationships it depicts are complex, it is actually a simplified version of the many complex relationships between soil minerals. Any additions of minerals in the form of added fertilizer, etc. Any loss of minerals from leaching, etc. Luckily for us, nature has developed in the soil a system of equilibrium, buffering, leaching, and recycling that will go a long way toward balancing these complex relationships in the soil. The soil foodweb, plant roots, sunlight, water, microbes, and macrobes all play their part in creating the dynamic and robust balance that is biological farming. It is up to us to figure out how to facilitate these processes where we can while trying to do as little harm to them as possible. The interaction between soils and plant life is heavily influenced by the mineral composition of the soil. Productive soils are made up of various forms of “parent “material, water, air, and organic matter (including living organisms). The parent material will vary in proportion of the various elements widely present at the earth’s surface. It will also vary in age, with “newer” rocks and minerals (volcanic, mountainous) having been on the earth’s surface a relatively short amount of time vs “older” minerals, which are eroded and transported to lower elevations. The erosion and transportation of the volcanic materials (feldspar, granite, mica, etc) often breaks down the original minerals, which then separate into larger particles (crytalline sands, often composed of 2 or 3 elements) and smaller particles (clays, containing many elements. The smaller particle size clays are mostly aluminosilicate (more, here and here) in composition with varying amounts of other essential nutrients for plants. Large particle soils tend to be more porous and permeable to water, while small particle soils tend to compact more easily and resist water penetration. A large soil particle will have less surface area per weight than a smaller particle, this provides less interaction area between the soil and the root. Because the process of erosion affects types of minerals differently, large particle soils tend to have less of a variety of elements (nutrients) than small particle soils. Because of these differences and others, sandy soils tend to hold more total water in the their pore spaces than clay soils. They also tend to allow water to pass through the soil profile more quickly. Clay soils hold less total water, but that water is less mobile (electrical attraction differences, etc.) and thus may be retained in the soil profile for a longer time between watering events (rain, irrigation, etc). In the pore spaces both water and air exist. Realizing that the air and water relationship in the soil is constantly changing, the following is an example of the complexity of the mineral reactions in the soil. As the percentage of water in the soil changes vs air, the availability of plant nutrients changes also – and each nutrient has a different availability (solubility) under each circumstance! Luckily, and naturally, the plant has a good way to deal with most of this complexity. By sending roots and root hairs out to different areas of the soil and to different depths of the soil, it can “average out” some of these differences in nutrient, water, and air availability. This allows the plant its best chance to bring in the right nutrients in the most beneficial ratios. There is another very important factor that helps regulate the entire process of process of water, air and nutrient availability. This factor is the difference between regolith (dirt) and soil. What makes the difference between soil and dirt is organic matter. It consists of humus, humin, glomalin, carbohydrates, proteins, small and large particles of dead roots, stems and leaves, dead bodies of microorganisms and much, much, more. Depending on the amount contained in the soil (5% is considered near ideal), this organic matter regulates and buffers most of the mineral and water interactions in the soil. It slows the passage of water when it is moving too fast. It absorbs soluble nutrients when there is excess (preventing toxicity and/or waste through leaching) and releases them when there are shortages. The many trillions of organisms (and millions of species?) are constantly making plant nutrients more available from the parent material of the soil and recycling nutrients that would otherwise remain unavailable. Information here about why the mineral wheel is important to farmers………….